Are you ready for an adventure? Then team up with ?Little Lou? as she jumps on her bike and heads out to explore the world around her. When she unexpectedly comes upon and rescues a stranded young grasshopper, a unique close friendship develops. Discover how Little Lou and Jack become best friends and the moral it relays. Shari is a Montana native. She is married and has two children and four grandchildren. She gives credit to them for the inspiration that motivated her to begin writing children?s books based on her own childhood experiences. In the author?s words, ?Writing these ?Little Lou? Adventure books is like taking a step back in time. They?re filled with the sincere passion and creative imagination of a little girl, a little girl who loves all creatures, large and small, and is on a mission to befriend them all.? Shari is an accomplished equestrian who particularly loves the Arabian breed. She has both owned and shown horses but no longer rides competitively. She is frequently involved in animal rescue. At present, Shari?s home includes a variety of both furry and feathered friends. The author?s goal in writing these delightful yet moral-based ?Little Lou? 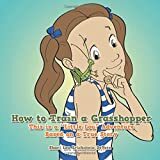 stories is to not only instill a compassion toward all living things but to encourage and inspire her young readers to be inventive and resourceful in their own adventures.